Microsoft’s announcement of the intention to sunset Windows 7 on January 14th, 2020, has companies rushing to ready their roadmaps to Windows 10. With this new deadline comes a new support fee for organizations that remain on the legacy technology. For those who fail to migrate before the January 2020 cutoff date, that continued support cost will rise each year. Without proper planning, however, your Windows 10 migration initiative could find itself stalled or facing hurdles that easily could have been avoided. Lean IT teams with bandwidth limited by other strategic initiatives are facing the risk of having operations and productivity heavily impacted by the migration process. Horror stories of users facing downtime and other issues for hours (and even days) are surfacing as companies scramble to beat the deadline. 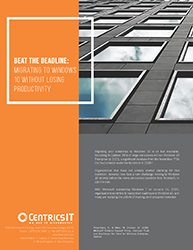 Avoid unnecessary logistical hurdles in your Windows 10 migration with this datasheet from the CentricsIT experts. Learn how to maintain end user support, streamline the upgrade, and prepare your organization to make the switch before January 2020.